Radcot Bridge crosses the River Thames at Radcot in Oxfordshire carrying the A4095 road across the river above Radcot Lock. Adjoining the bridge is the delightful Swan Inn and slight earthworks known as Matilda’s Castle. 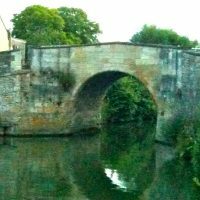 There are three stone bridges at this point on the Thames, Radcot Bridge itself plus the ‘Canal Bridge’ and ‘Pidnell Bridge’. Radcot Bridge is thought to be the oldest bridge on the Thames, having been built around 1200. The Cistercian monks of St Mary at Cîteaux in Normandy were granted land for the purpose by King John. Much of the original structure was destroyed during a battle which took place here in 1387 although it was apparently reconstructed six years later. The bridge was again damaged during the Wars of the Roses, and was later rebuilt as we see it today with a flattened centre arch. In a recent Time Team series an excavation on Matilda’s Castle was carried out. This revealed that some of the earth works dated from the Civil War when Parliamentary Forces built the earth works as a base for cannons aimed at bombarding the Royalist Forces hiding in Radcot House. The earth works were found to be on top of the remains of a Norman keep. Much of the remains had been damaged by the Parliamentarians during construction of the earthworks. There were also some possible Roman remains. Today it is a quiet and peaceful spot loved by the boating fraternity and fishermen although from time to time the Sealed Knot society re-enact the civil war battles in the surrounding fields. Today this tranquil spot serves to remind us that so many conflicts and wars are caused by beliefs and prejudices but rarely are things black and white and what is ‘right’ and ‘wrong’ is very subjective.